What is the "Warrior Series"? The Warrior Series is an after school activity where youngsters can enjoy multi sport sessions themes around famous Warrior Tribes such as the Ninjas, Zulus and Vikings! Each week they will earn either 1 or 2 stickers for which ever tribe it is that week, they have 8 to collect over 6 after school sessions. How long is the Warrior Series? A typical Warrior Series is run on one day after school over a 6 week period. These will usually be run for half of a term. How long are each session? Each session lasts between 45mins and 1hr, this depends on how long it takes for the kids to get changed! What do they do in the sessions? Each session involves themed warm up games to get the youngsters prepared as a Apache, Aztec, Zulu ect... The main focus of the sessions will be running a 1Km obstacle course two times (themed on the Warrior Tribe of the week). 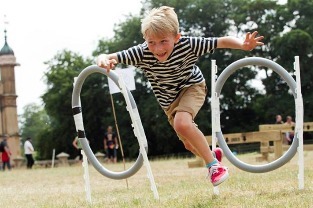 To see what sort of obstacles will be used check out the Obstacles tab on this website. What does my child get? Each Little Warrior receives a blank certificate on the first session, they will be given stickers of each Warrior Tribe to add to the certificate as they complete each session. They will also be presented with an Ultm8 Warrior T-shirt on their final session! It's £28 per child per series. This also covers the cost of their certificate, stickers and T-shirt they receive at the end of the 6 weeks. Can I get a refund if my child misses a session? Unfortunately not. However, if a child misses a session they can make up for it the following week by running extra 1Km lap and earn their stickers. They must attend the final session or they will not receive their Ultm8 Warrior T-shirt! Usually on the School field or nearby open space, if the location changes or the weather is too severe, the school will inform you. Sessions cannot be run inside. How many coaches will be there? Ultm8 Warrior coaches (or "Captains" as the kids call them) work on a 1 to 10 ratio. For children with special requirements or in need of additional assistance, extra staff can be arranged. Or course! "The Chief" (who will be present and in charge of all sessions) has a Degree in Sports Coaching as well as several other SCUK Qualifications such as The Fundamentals of Movement and Equity in Coaching. All Ultm8 Warrior Captains are CRB checked and are practicing Sports Coaches. How safe is the Obstacle Course? As obstacle courses aren't moving and unpredictable (like another child), it is much easier to assess any dangers or hazards beforehand. All of our obstacles are tested for weight bearing and structural integrity before being used with Juniors. So far, over 8000 children have run through our short and long distance courses with no serious injuries to date! On this rare occasion, the child will be treated by the First Aid trained Chief or an Ultm8 Warrior Captain. They will be taken into the school to receive further aid or an ambulance call if necessary. All injuries are logged and a new risk management procedure is put in place so are to prevent a repetition of the incident. Sign up to your School's Warrior Series today!